Ahead of the release of Sanjay Dutt biopic titled Sanju, director Rajkumar Hirani shines as the miracle filmmaker on the cover of India Today magazine. Rajkumar is touted as the miracle filmmaker owing to the blockbuster successes of his all ventures. Achieving not just critical acclaim but immense box office success, Hirani is undoubtedly the most successful filmmaker of Bollywood. 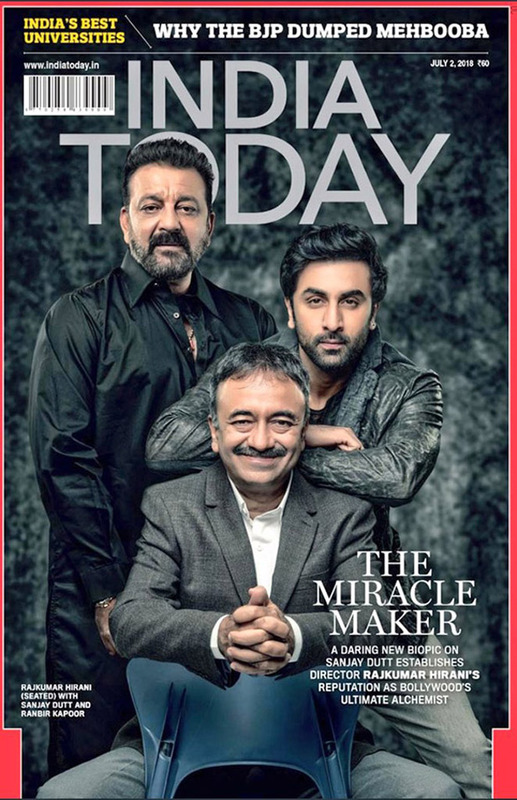 Featuring on the cover of India Today, Rajkumar Hirani strikes a pose with the reel and real life Sanju, Sanjay Dutt and Ranbir Kapoor, in the latest edition. On the cover, Rajkumar Hirani is all smiles while posing with his two actors. Sanjay Dutt is dressed in a black pathani whereas Ranbir Kapoor can be seen in a casual black leather jacket. Hirani is dressed in formal grey outfit. The tagline on the cover says, “The Miracle Filmmaker”. India Today lauds the director for his daring attempt for the upcoming biopic of Sanjay Dutt and establishes him as Bollywood’s ultimate alchemist. Making his debut with Munnabhai M.B.B.S., Rajkumar Hirani turned the super-hit film into a successful franchise with the phenomenal success of the second installment Lage Rahe Munna Bhai. The next venture of Rajkumar Hirani broke major records at the box office with the stupendous success of 3 Idiots, followed by PK. With the upcoming Sanju, the entire film industry has its eyes on the biopic of Sanjay Dutt to witness the phenomenal work of Rajkumar Hirani. Written and directed by Rajkumar Hirani, the film will also star an ensemble cast in addition to Ranbir Kapoor which includes Paresh Rawal, Manisha Koirala, Vicky Kaushal, Sonam Kapoor and Dia Mirza amongst others. Produced by Vinod Chopra Films and Rajkumar Hirani Films in association with Fox Star Studios, Sanju is all set to be released on June 29, 2018. IIFA 2018 Press Conference: Varun Dhawan, Shraddha Kapoor, Kriti Sanon, Karan Johar, Arjun Kapoor stir up a stylish storm!